I found the most adorable bath game over at Amazon.ca today and just had to share. You need to grab the Meadow Kids Counting Bath Time Stickers. This educational toy was $21.99, but you can grab it for only $7.82! I have been looking for a few kids bath toys to mix things up so my little one has fun without splashing me so much! I have had a few ideas, but these Meadow Kids Bath Time Toys are among my favourites. Some of these sets have limited stock, so if you want one buy right away! One of the best deals is the Meadow Kids Counting Bath Time Toy. This fun toy was $21.99 but is now on sale for $7.82. These beautiful full-colour foam pieces stick to your tub or tile after they get wet. This is a big 42 piece set that includes ten hot air balloons specifically to help teach your child to count from one to ten. Bath time is a great time to practice counting skills and a tile wall gives you a big canvas to play. Also included with this set is a net bag with suction cups so the water drains off the pieces. 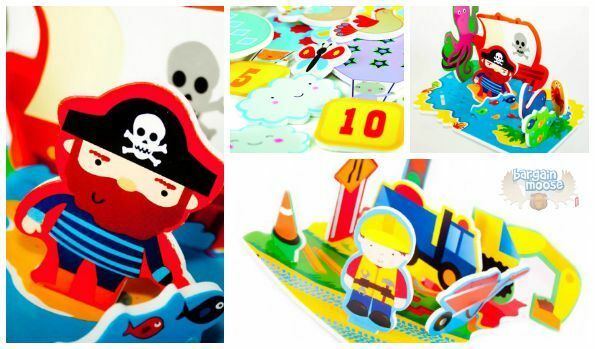 If you want a set with more details, you should see the Meadow Kids Treasure Island Floating Activity Scene. This set was $21.99 but is now only $10.73. Included is 16 pieces that float in the water to create a play set in the tub. This toy is pirate themed with a ship, octopus, pirate flag, pirate, and more. I think this is adorable and would make a fantastic gift. There is also a second elaborate floating play set, the Meadow Kids Diggers and Dumpers Floating Activity Scene. This set was $24.63 and has dropped to $13.78. If you have a kid who is obsessed with trucks, then you know just how fantastic a find this set is! This floating playset also includes 16 pieces and has trucks, diggers, traffic cones and all kinds of construction fun. If you know a kid who is into construction, this is a perfect set. Over at Toys R Us Canada, where they should have a nice selection of bath toys I was only able to find a standard set of foam letters and numbers for $9.99. These look much less interesting then the Meadow Kids version. I also found these somewhat foam animals over at Bed Bath & Beyond Canada for $11.99, but they have no details on them at all and the estimated shipping of $9.50 is not pretty. I do not think you will find a similar set at this price. These sets are tiny in comparison, but there simply is not much else on the Canadian market. These items all qualify for Amazon Prime, so if you are a member you will not pay anything to ship at all. If not, they will also ship free if you spend $25 with free super saver shipping. Quick Bargainmoosers, I bet these adorable sets will not last very much longer.